To Kill a Mockingbird by Harper Lee. I love this book. In some ways it infuriates me, but it also gives me hope. I’m glad the book is written from the point of view of a child, because if it were written from Atticus’ point of view or Miss Maudie’s point of view or just an omniscient third-person narrator, it wouldn’t work. Scout’s voice brings a touch of innocence into the story. Not a goody-two shoes or un-experienced innocence, but a belief that the world is good, and your father is right, and people can be trusted. Then as a reader I get to be there when Scout’s innocence is clouded and confused and darkened. And again when she learns there are still some good people in the world. Though her father is right, in the Depression-era South, he can’t win a case against a black man no matter how hard he fights for the truth. When Scout and Jem get attacked by Mr. Ewell, they learn about violence and hatred firsthand. But they also learn a thing about judging people. The reclusive man they’ve gossiped about all summer, Boo Radley, is their savior, grabbing them away from Ewell and stabbing him with a knife. And suddenly, Boo Radley is a real person, a kind person, a brave person, not the crazy weirdo that they suspected. 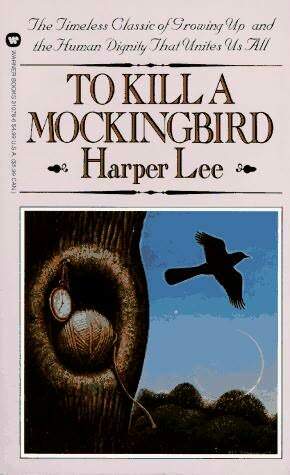 It’s interesting that Atticus says that killing a mockingbird is a sin. I am not a fan of mockingbirds. I think they steal other birds’ songs. Do they even sing their own songs? I don’t know. I’d love for you to weigh in on that. I understand that a this books deals with sin and how different people view and define sin, but I still struggle to connect that to the mockingbird. And go here to read Karla’s choice.